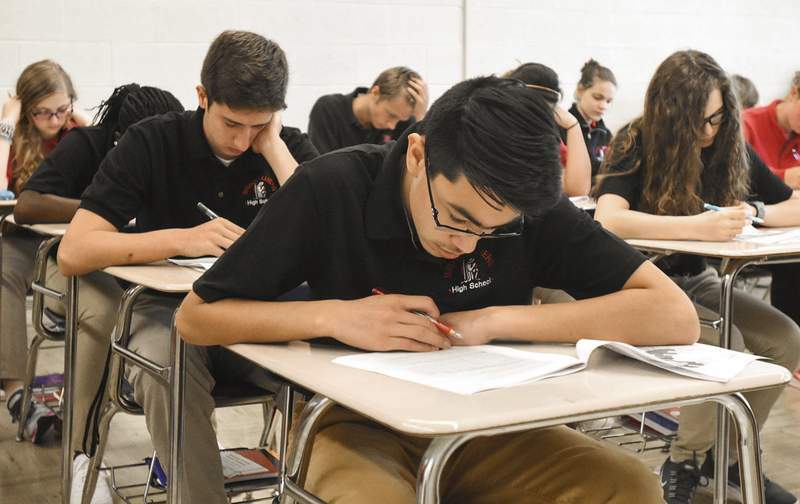 Uriah Vazquez, a freshman at Bishop Luers High School, works on a pretest in world history. 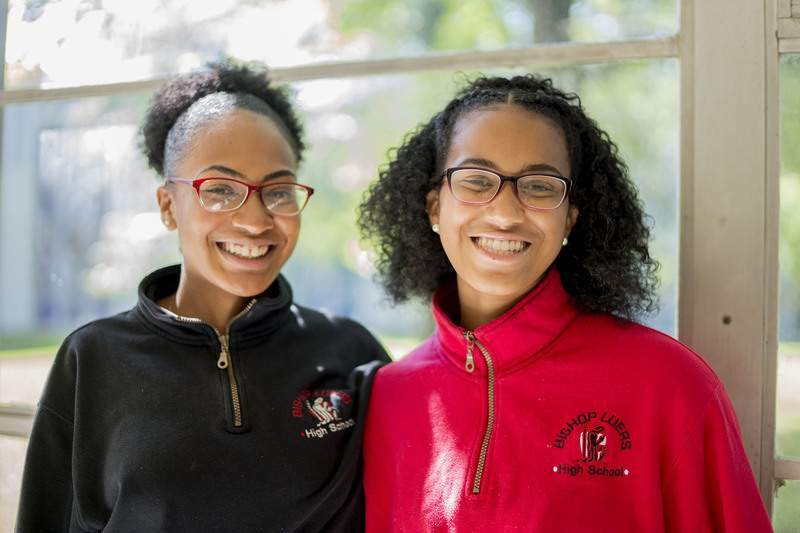 Ani King, 15, left, and her sister Camille King, 17, are a junior and senior at Bishop Luers High School. Beth and Heath Bearman come from a family of public school teachers and enrolled their children in public schools. Over time, however, their satisfaction with Fort Wayne Community Schools waned as classes became more disruptive and less like a learning environment, Beth Bearman said. 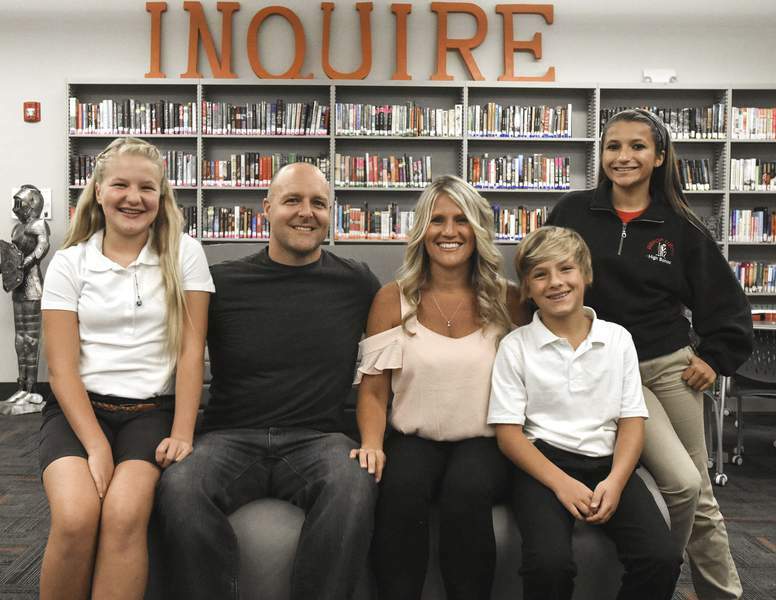 The difference between public school and parochial school environments was especially clear after son Enzo's first day as a third-grader at Saint John the Baptist Catholic School in Fort Wayne. When asked whether anyone got into trouble, they recalled, the now fifth-grader said yes – but nobody threw a desk. Vouchers made it possible for the Catholic family of eight to send their children to parochial schools, with one currently attending Bishop Luers High School and two at Saint John the Baptist. Three of their children are in college. Their story is typical of families using the School Choice Voucher Program, said Jenny Andorfer, Luers' director of admissions. Founded in 1958, the Catholic high school in south Fort Wayne has gotten $6.97 million in vouchers since 2011-12, with last year bringing in about $1.89 million for nearly two-thirds of its 617 enrollment. Vouchers don't cover the full tuition, which varies depending on the number of children enrolled and whether the family is registered in a diocesan parish. The 2017-18 tuition for one student is $5,775 for registered families and $7,008 for non-registered families plus $1,220 in fees for all. Luers, which is owned and operated by the Roman Catholic Diocese of Fort Wayne-South Bend, also offers financial aid and scholarships. “We want to make private school education affordable for all families,” Andorfer said. With a maximum capacity of 720 students, Luers aims for 600 students and was just shy of that target at the start of the academic year with 587, she said. Since 2010, its student body has become more diverse, racially and economically. Seven years ago, 81 percent of students were white compared with 57 percent last year. The Hispanic population has grown from 6 percent to 19 percent, and the black population has nearly doubled, increasing from 9 percent to 17 percent. In 2010, 15 percent of its students were on free or reduced-price lunch; last year, 37.5 percent were. The special education population has remained steady at about 6 percent in recent years. Its graduation rate has consistently surpassed 95 percent in recent years, and its overall A-F grade only last year fell from an A to a B. The state's accountability system considers multiple factors, including graduation rate and student performance in math and English. It has faced criticism from school leaders, who have said the grades aren't an accurate reflection of what happens in classrooms. With more voucher students, Andorfer conceded there has been a slight negative impact on the school's overall academic performance. But she says the school makes its expectations clear and doesn't pick and choose only the best students. “If we look at a student's application and we feel that they have failing test scores, failing grades, we take into account the middle school they attended, and if we feel it's not in that student's best interest to be here, or that they cannot be successful here, then we do reserve the right to not accept them,” Andorfer said. Andorfer, who guided reporters on a brief tour at the start of the school year, noted the building itself doesn't have many frills. Analog clocks hung in the hallways, and chalkboards were visible in classrooms. A window-lined hallway provided a courtyard view, where Andorfer commented on the school's size. “You're looking at the whole building, almost,” she said. Like any high school, flyers dotted the walls to promote various programs, a trophy case boasted of students' accomplishments and athletes' lockers were decorated. But this clearly is a parochial school. Students wore uniforms – generally, red or black polo shirts paired with khakis or black pants – and in one hallway was a wooden cross draped in rosary beads. Plus, a chapel greets students in the entryway every morning. Online, Luers describes its education as a faith-based, college preparatory curriculum that educates students spiritually, academically and socially. The religious education piece is an aspect both students and parents said they value. Rica Rodriguez, a junior, likes that students can talk about religion any time, with any teacher, she said. Camille King, a senior whose parochial school experience began with neighboring Lutheran South Unity School, isn't Catholic but said she isn't treated any differently. Her younger sister, junior Ani King, said she appreciates teachers' willingness to help students. After trying everything to stay in FWCS, the Bearmans said their children have found success at Luers. They noted its small classes – the school website boasts a 16:1 student-to-teacher ratio – and students' behavior.